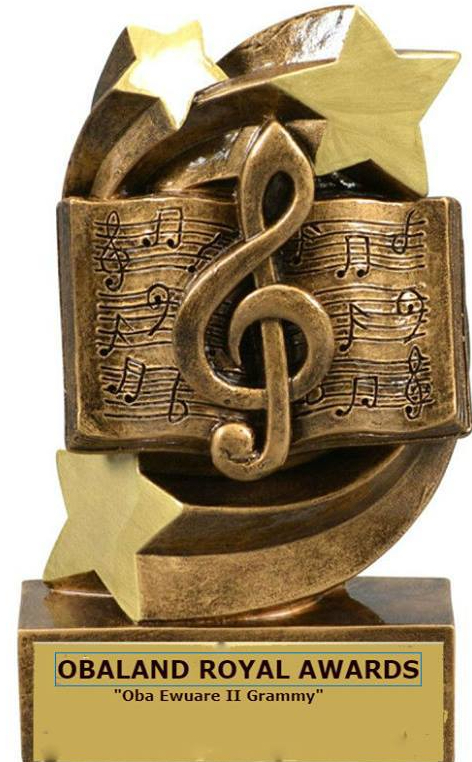 Obaland awards (Honours) has three major categories, namely “Obaland Music Awards” to be the (National honour) and “Obaland Royal Awards” which is (International honour) and the Monarch National Order (MNO) . All constituted by 45 traditional rulers under his royal majesty Oba nèdo Ewuare II to represent as a prestigious international and national “Honour” .The memorandum and act, were written under traditional ruler’s national act No 4, on 17th December 1993, with similarities to the National Honors Act No. 5 of 1964, during the First Nigerian Republic, to recognise personalities, with indisputable hard work in terms of social presence , Government institutions, privates or in entertainment industry, the process has in-house procedures and could be given anytime of the year by Obaland academy committee only, without nominations or public votes. Creative Commons Attribution Share-Alike License was merged with this page by Admin.